This was an interesting read and something both Panuku Development Auckland, and Auckland Design Champion Ludo Campbell-Reid should look at. If it is a win with pedestrians and a win for moving traffic then it is a win for the area! The idea behind “shared space” street design is that less can be more. By ditching signage, traffic lights, and the grade separation between sidewalk and roadbed, the shared space approach calms traffic and heightens communication between drivers, pedestrians, and cyclists. Instead of following traffic signals on auto-pilot or speeding up to beat the light, motorists have to pay attention to their surroundings. Shared space design has been shown to calm vehicle traffic and allow more freedom of movement for pedestrians with no increase in traffic injuries. 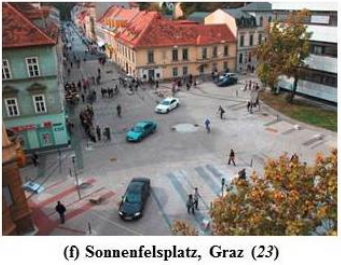 A new study from professor Norman Garrick and Benjamin Wargo at the University of Connecticut finds that in the right conditions shared space also makes intersections more efficient for both pedestrians and motorists.